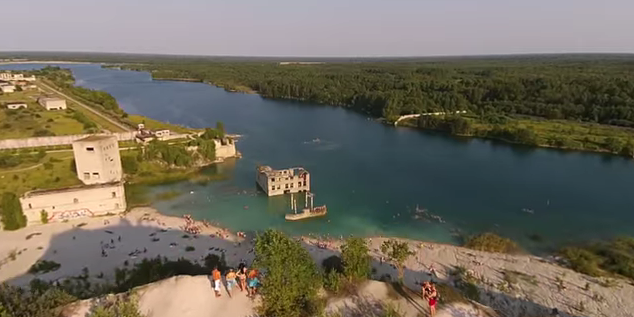 A former limestone mining quarry and the adjacent former Soviet-era prison in Rummu have been turned into Estonia’s “blue lagoon”. Murru limestone mining quarry was established in 1938, in Rummu, near Tallinn in northern Estonia. Limestone mining continued during the Soviet occupation and was done by convicts of the adjacent Murru prison until the restoration of Estonian independence in 1991. Once mining was no longer necessary and draining of water was stopped, the quarry filled up with natural water and turned into what has recently become known as “blue lagoon”, with crystal clear water. Abandonment of the quarry happened so fast that even some machinery was sunken along with the building complex. Perimeter of the prison was decreased to exclude the “blue lagoon” and the prison remained active until the end of year 2012. Since then, the place has become an increasingly popular leisure spot – from swimming to diving, and even a location for making videos. A few videos of Murru quarry in Rummu have also been featured and become popular in the international media. Rummu, a former Soviet-era prison camp, transformed into sandy beach site, with a crystal clear water. Rummu quarry has also become a popular diving spot. Ukrainian-based synthpop dance band Kazaky, also known by their collaboration with Madonna, used the former prison by the Rummu quarry to film the video for the band’s single, “Crazy Law”, in 2013. The video was directed by Estonian director and producer Hindrek Maasik.